iMessages activation issue is one of common problems you may face when updating iPhone/iPad to a new iOS operating system, such as iOS 8, iOS 9 and 9.3. Although the new released 9.3 aims to solve this activation problems, it seems have brought new iMessages problems to some users, people reported “can’t send and receive iMessages after updating to iOS 9.3” (have no solution now). In this post, we just talk about some basic tips to solve iMessages activation failed problems, and hope the future iOS could solve the iMessages bugs in iOS 9.3. Now let’s check the tips below. Make sure cellular data and WIFI connected well. Set up your Time Zone correctly. Force restart: Holding both “Power” and “Home” buttons to turn off device, and then turn on device. Make sure you can receive SMS: If you are using iPhone, you can contact your carrier to make sure you can get text messages. Log out Apple ID and then login. You iOS device > Setting > General > Reset, you can reset network or reset all contents and setting now. “How do you recover deleted text messages on iPhone? “ Lalolozai questioned on Apple forum. In this post, we are talking about how to retrieve iPhone messages, including SMS, iMessages, WhatsApp messages and Skype messages. How to Get Back Deleted Messages from iPhone? 1, you can directly restore your iPhone/iPad from backup if you have one iTunes/iCloud backup. If you have a good habit to back up your device everyday, absolutely, you can get back the messages you deleted easily by simply restoring, which is the perfect free way to retrieve something you lost on your iPhone/iPad. 2, you can restore only the messages and messages attachments from iPhone by using third-part software. Some backup extracting tools enable you access iOS backup and extract specific data from your iCloud or iTunes backup. And some of these tools provide free trial, such as AnyTrans. 3, you can try to scan your deleted messages on iPhone if there is no backup you created before. Although Apple doesn’t provide you the official tool to recover text messages, there are also some softwares you can try to scan and find the deleted messages that are not overwritten. And most of them are able to recover more than deleted SMS. “My iPhone 6 Plus started to download deleted 5000+ email on my mail server to my iPhone after using iTunes sync. What can I do to remove them from my iPhone, iOS 8? I have followed some guide online to delete emails from all mailboxs and trash, and change back to weeks ago. However, it doesn’t work.” — Jason, question from Discussion Apple. “I found there is no trash all to 1-click delete all emails on my iPhone” — iOS 10 user. When you want to free up your space, tap on your iPhone, and going to usage, you may found your email store is more than 500 MB used. Deleting all emails in iOS 9 is so easy since iOS 9 offers you “Trash All ” on Inbox and other Mailboxes to make it. but how to quickly delete all emails in iOS 8/10 devices? Besides removing emails one by one, this is one simple method to delete all emails on iPhone iPad inbox for iOS 8 and iOS 10. Open Inbox > Edit > Check one message; it will highlight the move button. Press and hold”Move” button and uncheck the message that you checked before. Lift all your fingers off screen and leave it alone. Choose trash to delete all emails on your iPhone iPad. “I have deleted all photos on my iPhone 6, and now there is Zero pics in Albums, including Camera Roll, Recently Deleted, Synced from iPhone and Photo Stream. However, when checking setting > general > usage > storage > manage storage, it shows 0.9GB in photos & camera. And iTunes shows there are 0.9 GB also. So something hidden behind are eating my iPhone space? “Jaassy posted his question recently after updating his iPhone 6 to iOS 9. Deleting attached pictures in Messages/WhatsApp/FB Messenger. Syncing iPhone again without selecting any photos. Resetting iOS device to factory setting. >>>>Set date back to September 1st, 2014 and clean “Recently Delete”. 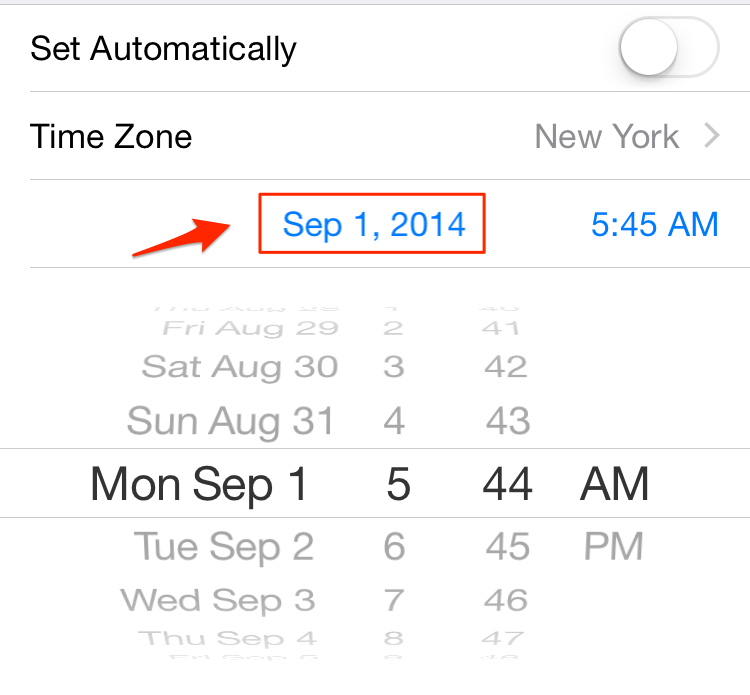 iPhone 6 > Setting > General > Date & Time > Turn off Set Automatically. Set time back to Sep 1, 2014.
iPhone > Photos > Albums > Recently Deleted. Welcome any comments to share your idea about how to solve phantom photos problem. “Upgrade to iOS 10, my iPhone won’t sync music and playlists with iTunes, and even after I upgraded my iTunes to iTunes 12.5.1” – one iPhone 6 user questioned on iPhone forum about “iTunes can’t sync”.In this September, 2016, you may face the same iOS problem when syncing iTunes music library to your iPhone or iPad/iPod after updating to iOS 10 final version or coming iOS 10.x.x. Although, Apple always release new version of iTunes to fix coming iTunes bugs and sync problems (recently, Apple released iTunes 12.5.1 to better support iOS 10 updates, the problems never be completely fixed. So what if you get this kind of iTunes issue and cannot sync data from iTunes to your iPhone 6 or other iOS devices, how can you fix it? Solution 1. Sync again after turning off iCloud Music on your iPhone. Tap “Setting” on iPhone > “Music” > Turn off “iCloud Music Library”. Note: this method is not available for Windows vista. Solution 2. Sync after turning off iTunes Match on iPhone. Make sure that you don’t have iTunes Match enabled in Settings > Music. Plug in your iPhone, iPad or iPod and launch iTunes. Click your device icon at the top of the iTunes window. Uncheck Sync Music option in the right panel and then click Apply or Sync. Once the sync is complete, recheck the box for Sync Music and hit Apply or Sync again. Solution 3. Sync after turning off Show Apple Music. Reset iPhone 5 by holding “Power” and “Home”. If you are one of windows users who meet this iTunes sync issue, you can check whether the permission property of your “iTunes” folder or the data you plan to sync is “Read Only”. If you checked “Read Only”, you cannot transfer or edit the file but only read it. Open Windows Explorer > Music > iTunes, right click this folder and go to Properties, and uncheck “Read Only”. Solution 6. Use iTunes Alternatives. If you still cannot use iTunes to sync iPhone iPad, you can look for help from some iTunes alternatives, such as AnyTrans, to share songs, movies and pictures across all of your Apple devices. It’s said that it also helps sync your selected files from iPhone to iTunes. Leave a comment, no matter it is iOS 9/iOS 10 problem or related solutions, which may be helpful to others. How to Fix iTunes Won’t Sync – iMobie Guide. Turn Off Apple Music Streaming after 3-Month Free Trial ? “I don’t plan on continuing with Apple Music once the free trial is over”, Europa said at everythingiCafe iOS 8 forum. Then, how do you turn off Apple Music Streaming Service after free trial? Actually, it is simple to stop auto-pay. Tap upper-left head pic at Apple Music app > View Apple ID > Manage Subscriptions > Now you can disable automatic renewal.